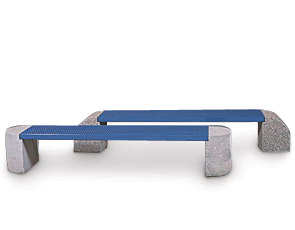 These powder-coated steel benches are supported by concrete ends for ultra support and durability. Steel-reinforced concrete construction provides the strength to last in heavy traffic areas for years of usage, and the expanded steel bench seats offer smooth comfort and style. Concrete ends are sealed with water repellent sealer for protection and durability. Choose from the many different colors and finish options shown to match your facility. Bench seats are available in the Powder-Coated Color Options shown.